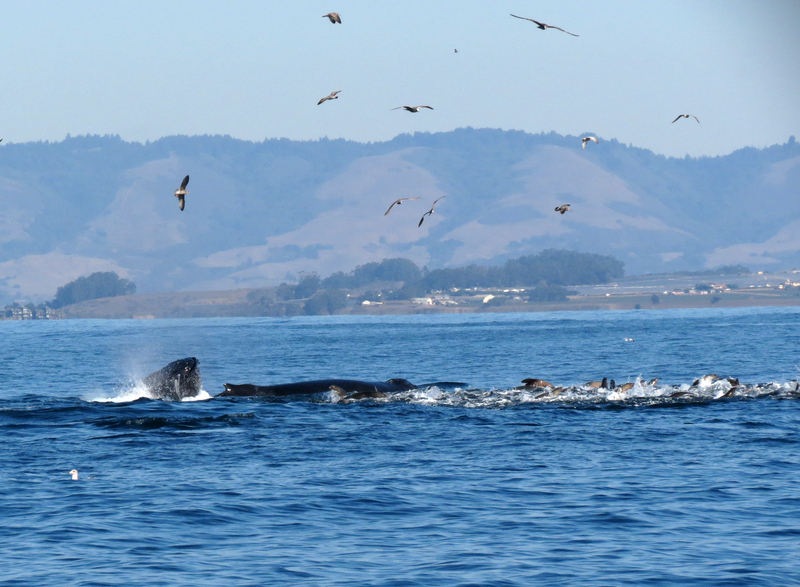 Monterey Bay has been the source of news stories recently for the abundance of whales residing locally these past couple months while feeding on an unusually large number of anchovies. So yesterday, on the coldest day of 2013 when the temperature did not even reach 50 F. in Monterey, I embarked on a whale watching tour. The sun was shining bright in clear skies and I wore plenty of warm layered clothing. New York Times: With Extra Anchovies, Deluxe Whale Watching (Nov 25, 2013). 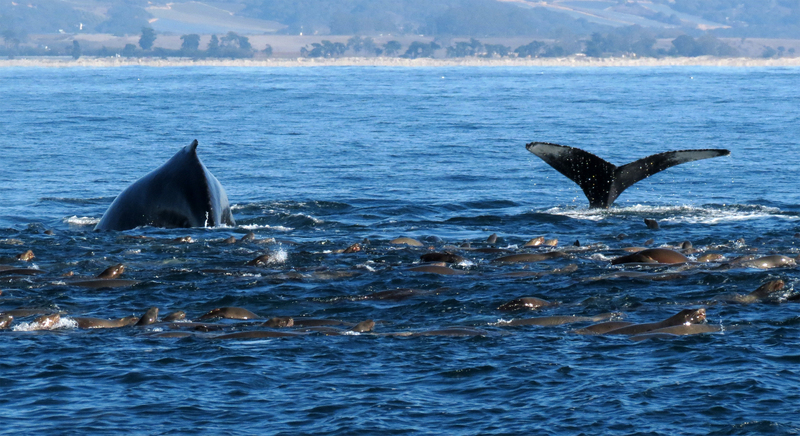 ABC News: Whales, Dolphins Putting on Spectacular Show in Monterey Bay (Nov 30, 2013). After paying $33 to Chris’ Whale Tours ($2 off regular $35 price for mentioning the website), I headed out on Monterey Bay to check whale tails myself. And it was amazing. I am not sure how many whales I saw, but the number of humpback whales I spotted was in the 30 to 50 range in a one hour period. This is compared to a 7-day Alaska cruise in August 2007 where I saw one whale. Humpback whale swimming beside Princess Monterey whale tour boat. 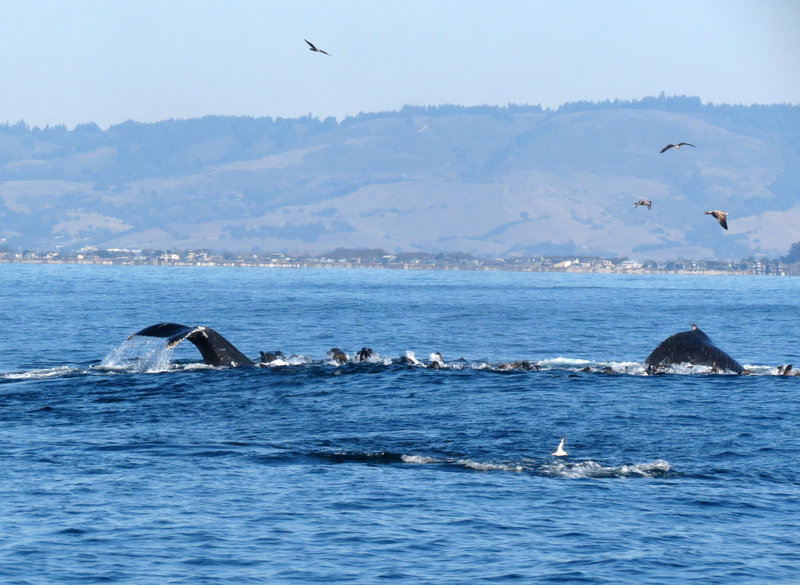 There are a number of tour operators running whale watching cruises on Monterey Bay. At Fisherman’s Wharf there are at least four tour operators. I have no interest in promoting any particular whale tour business. Based on my experience yesterday, the tourists on Princess Monterey consistently had the best viewing locations since many of my whale photos also show Princess Monterey in the photo with the photographers on their boat much closer to the marine mammal action. Coast Guard jetty protects Monterey Harbor. Hundreds of sea lions reside on the rocks here. Monterey’s Cannery Row is seen in the background. I wrote a piece on the jetty sea lions with photo close-ups Sep 11, 2013 See Life in Monterey. Sea lions resting on Monterey Bay buoy. Best Western Plus Monterey Beach Resort is the hotel on the beach at right. There is currently a plan to develop another hotel on the beach at the left end of this photo. I am hoping that one does not get approved. The land directly behind the city of Seaside is Fort Ord National Monument. There is currently an attempt to build a horse racing track in an undeveloped portion of land next to the National Monument. Voters rejected that plan last month in the local ballot, but with the kind of money involved the idea does not seem likely to die off soon. Point Pinos Lighthouse, Pacific Grove is the oldest continuously operating lighthouse of California and the entire west coast. Pronounced PEE-Nose. Sitka, Alaska (1837) was the first lighthouse on the west coast, but the original structure was torn down. Alcatraz Lighthouse in San Francisco opened eight months before Point Pinos (1855), but it was also demolished, although rebuilt in its original location. Point Pinos lighthouse has operated continuously for almost 160 years. Point Pinos Lighthouse history. Point Pinos lighthouse beam of light is visible for 17 miles out to sea. The lighthouse has had 14 resident keepers from its initial construction in 1853 until 1975 when the lighthouse was fully automated. Point Pinos lighthouse these days is operated by the U.S. Coast Guard. In the North Pacific there were an estimated 1,400 humpback whales in 1966 after heavy commercial slaughter. Today there are estimates of about 22,000 humpback whales in the North Pacific, around 25,000 in the southern hemisphere and about 11,500 humpbacks in the North Atlantic. In the Pacific there are three migratory patterns. Source: NOAA Fisheries. Washington, Oregon and California humpback whales winter in Central America and Mexico and summer along the west coast of the USA up to southern British Columbia. Central North Pacific stock that winters in the Hawaiian Islands and summers from northern British Columbia and eastern Alaska. Western North Pacific stock that winters in Japan and summers in western Alaska and Aleutian Islands. A hot off the press three year scientific study SPLASH of humpback whale DNA released this week concludes the North Pacific humpback is genetically isolated from other humpbacks around the world and there are five distinct population groups. These North Pacific humpbacks have genetic variations and different breeding and feeding grounds. The five populations identified in the study are: Okinawa and the Philippines; a second West Pacific population with unknown breeding grounds; Hawaii, Mexico and Central America. The SPLASH program has used photo identification records to estimate humpback whale populations. The researchers estimate that there are approximately 22,000 humpbacks throughout the North Pacific — about the same as before whaling reduced their numbers. Although recovery strategies have been successful on a broad scale, recovery is variable among different populations. Humpback whale dorsal fin is small compared to a whale like an Orca, the killer whale. The humpback name derives from the curving of their backs when diving. The photo above shows what I typically saw when spotting humpbacks on my whale cruise. I have about 50 photos like this. There were no breaching humpbacks jumping out of the water. I photographed about 15 whale tails. This was the closet I was to a humpback whale at about 150 feet away or about three body lengths. 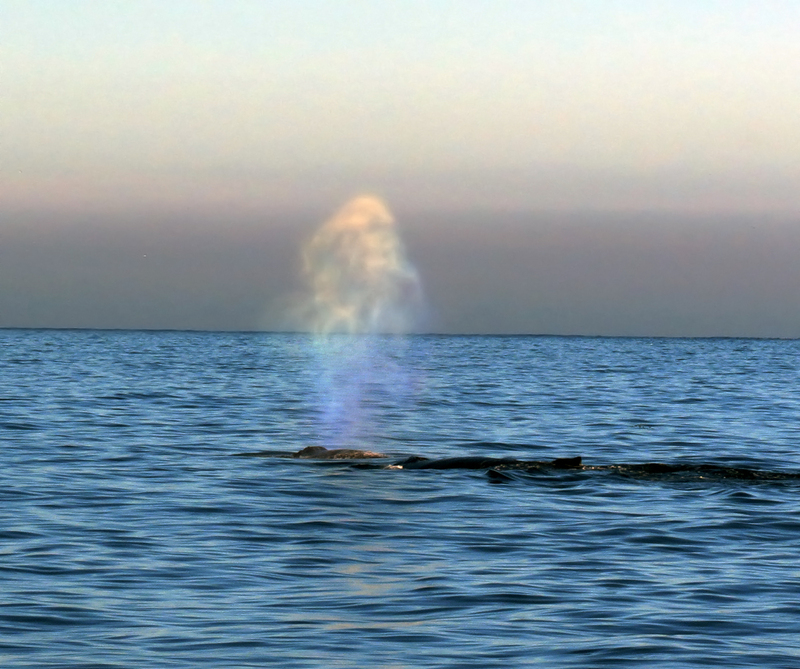 Typically from the shoreline of the Monterey Peninsula and Big Sur I spot whales from their blow spout with plumes of water rising around 30 feet in the air. 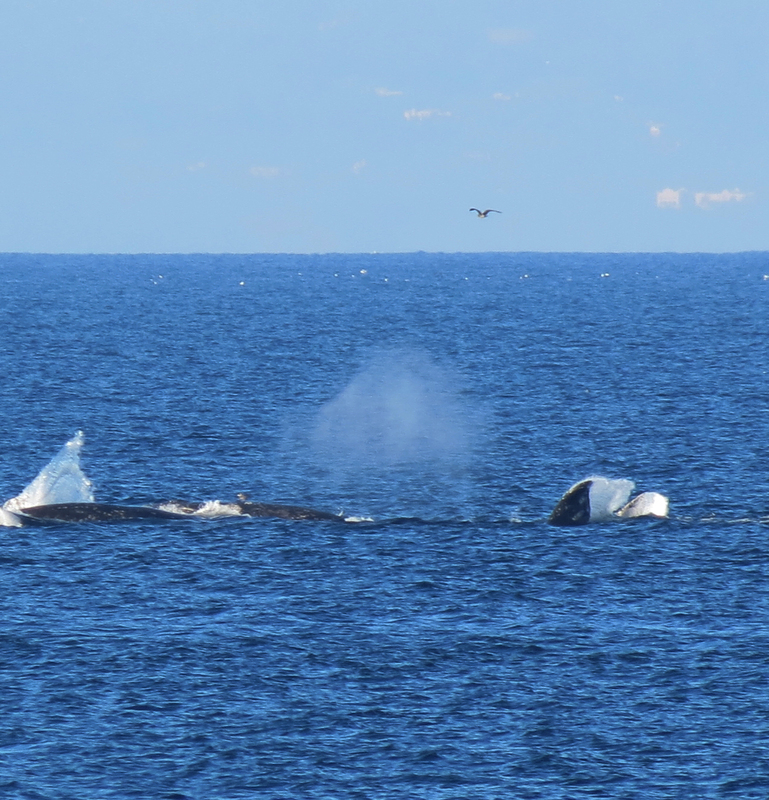 When I say I saw about 50 whales yesterday, that was based on the spouts of water I spotted. I photographed about 20 whales where the body or tail was visible. The peak in the background is Loma Prieta in the Santa Cruz Mountains and the epicenter of the October 1989 World Series earthquake. The whale blow hole spray is much more dramatic from up close. Humpback whale blow. One article I read stated this spray can be forced out at 300 mph. Humpback diving with exposed whale tail. These photos are two images in a ten photo series covering six seconds of this whale from the blowhole spray to the dive. I wanted to take video, but even standing and snapping photos was difficult in the small ocean swells. Generally I braced myself with one hand on the ship rail. Walking along the deck was challenging when the ship was in motion. Princess Monterey in my photo of two humpbacks. The Princess Monterey always seemed to be in the right position for the best proximity to whales. And it seemed like that ship was moving less than the boat I was on. There were probably 200 to 300 sea lions feeding in a pack. The humpback whales surfaced in the sea lion pack. I was surprised when our ship started heading back to Monterey just as we were in the thick of the action. We left before the other two boats from two other Monterey whale tour companies. The total tour time ended up being about 2 hours 20 minutes from departure and back to the wharf. One aspect about Chris’ Whale Tour that I felt could be improved was better use of the travel time across Monterey Bay to provide educational information. There was plenty of time to educate us about the marine mammals, but there did not seem to be much talking during the cruise. Length up to 60 feet with females being larger than males. Weight 25 to 40 tons. Newborns are about 15 feet long and weigh about one ton. Diet is krill, plankton and small fish. Eat up to 3,000 pounds daily. Humpbacks have the farthest migration pattern of any mammal, from 3,000 to 5,000 miles one way annually. Humpbacks have been tracked making the 3,000 miles journey between Alaska and Hawaii in as little as 36 days. Humpbacks are a popular whale species for cruises due to their tendency to breach or jump out of the water. Another thing I noticed about Princess Monterey is the boat stayed closer to shore on the way out providing better opportunities for photography of the Monterey Bay coastline. Paddle boarders off Monterey coast. The hills of Monterey, Pacific Grove, Pebble Beach, Carmel and Carmel Highlands are the largest remaining stand of native Monterey pine forest. Even on the coldest day of 2013 this trip was great value. Monterey Bay under bright skies, numerous humpback whale sightings and a sea lion feeding frenzy were memorable sights to see. 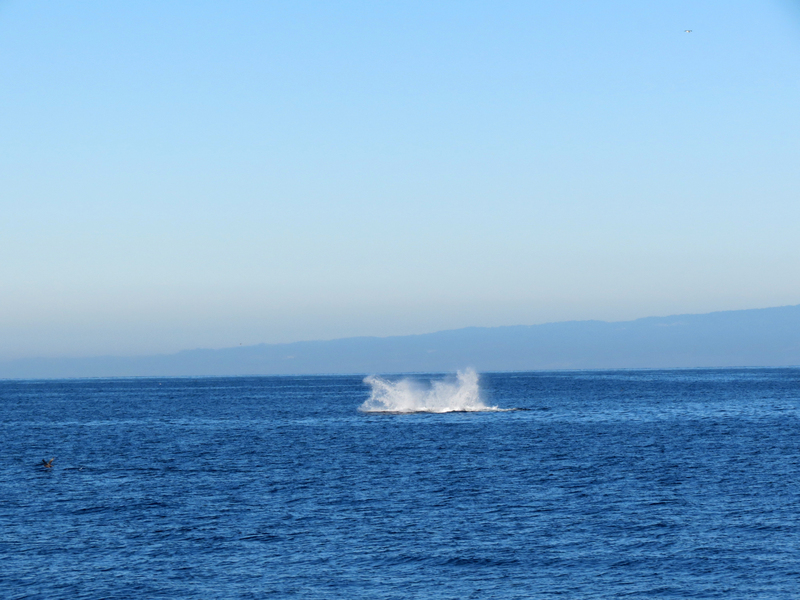 And I read that the first Gray Whales heading south to Baja were seen this week on the whale cruises in Monterey Bay. This is a great time to come to Monterey Bay and get on a whale cruise. View of mountains beyond mountains with the Monterey hills, Carmel Valley hills and Santa Lucia coastal mountain range (Big Sur country) in the background. Monterey Bay was originally named Bay of Pines when Cabrillo passed by here in 1542. Always enjoy the Monterey posts. Couldn’t do a whale cruise on our last visit (rough seas), but it’s on the list for next time. Ric, as always great post. I did the whale watching long time ago, it was so excited need to go do it again soon. Thank you for wonderful post. Love the Monterey posts ! We REALLY enjoyed the time we spent there this past summer. Lots of marine life and always the great parks. Take it over San Francisco any day ! The water looked relatively calm for our cruise. The boat traveled around 15 miles out in the bay and when it hit high speed over the gentle swells, I had to hold on tightly to the railing to move around the outside of the boat. I plan to take some more whale cruises this winter season. There seems to be some luck involved in being in the right location at the right time to get the special moment experience. Monterey is pretty laid back, especially compared to San Francisco or even Santa Cruz. 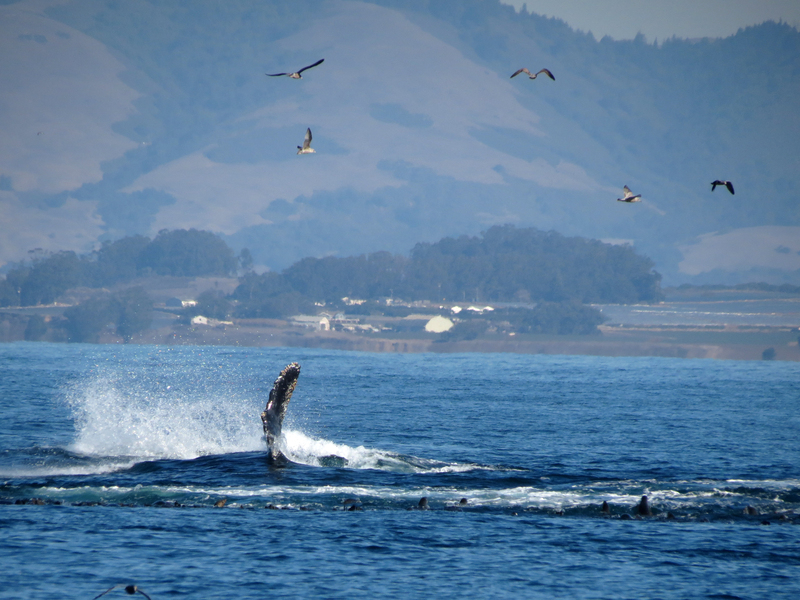 Moss Landing and Santa Cruz are two other whale watch tour boat locations. I wanted to try Sanctuary Cruises in Moss Landing, but they are not running this month and start up again in January. They advertise the educational aspect of their whale tour. The tour operators on Monterey Fisherman’s Wharf look like they run two cruises daily at around 10am and 1:30pm. On a weekday it is easy to get on a boat. Friday and weekends the boats tend to get booked in advance. I was a walk-up ticket purchase on Thursday afternoon. I took the same tour with the same operator on Wednesday morning. I liked that, when I made the reservation they did not ask for a credit card. I believe all other companies do, and Princess doesn’t allow to cancel the tour as soon as you pay for it. On the other hand I know that the day we went another tour saw many (hundreds) of dolphins. We saw none. We did see two breaching. Do you see whales from the shore sometimes, and if yes, where from? @Mila – Nice photos. I think it is likely a matter of luck being on the boat that happens to be in the right spot for whales. From shore there are several places where I have seen whales. These are all places where I have watched whales cruise by the coast. Gray Whale season has started. Two years ago I watched a pod of more than a dozen gray whales swim by the Hyatt Highlands Inn while sitting in the lobby with my binoculars. The whale tour is a great experience for getting close to whales. The best view I had of whales from the coast was somewhere along Highway 1 around Big Sur several years back when my wife and I were on a cliff a few hundred feet above the ocean and a gray whale and calf were in the cove below us and we were able to observe them for 30 minutes or so. A mental memory. No camera. Thank you, Ric, for telling me about the places to see whales from the shore. Yesterday I went to another whale watching tour with another company. It calls The Monterey Bay whale watching. It is more expensive, and I liked the first one much better, but it is probably because we saw more whales feeding together with the sea lions on the first one. Generally speaking I was disappointed with that second tour but maybe it is because I was spoiled by the first one. @Mila – I hiked around Point Lobos on Saturday and saw more than a dozen whales from shore. One of the best sightings of whales from the shoreline I have ever had. The gray whales are passing by on their southern migration to Baja for calving season. There also appeared to be a sea lion group feeding with some humpbacks hanging out in the group.